Not long after Huggins assumed responsibility for the care and use of the Royal Society's Grubb instruments, he fell victim to public criticism from colleagues who questioned the wisdom of placing such unencumbered resources in the hands of an independent individual. This criticism, coupled with his own strong desire to be recognized by his fellows as a worthy custodian of the Royal Society's telescope caused Huggins much personal anxiety. Before turning to this important issue in the next chapter, I shall focus on another problem Huggins encountered during the decade following his election to Fellowship in the Royal Society, namely, his increased involvement in observations which required assistance. We have seen in chapters 2 and 3 that Huggins relied on his neighbor, the chemist William Allen Miller, to confirm important telescopic observations and assist in spectroscopic comparisons until Miller's untimely death in 1870. Occasionally other friends who lived nearby provided temporary assistance.1 But Huggins could not long continue as a solitary observer if he wished to maintain his position on the cutting edge of research in astronomical physics. Huggins faced a growing field of able competitors in London and abroad, who vied with him for the same prize discoveries: to decipher the spectral code of the nebulae, to reduce the varieties of stellar spectra to a seemly and sensible order, to bring the full potential of the spectroscope's analytic power to bear on the solar surface and its immediate environs, and/or to be the first to observe some new as yet unimagined celestial phenomenon. We saw in the last chapter, for example, that Huggins had already experienced a loss of priority to Lockyer's and Janssen's independent claims to have found a spectroscopic method for viewing solar prominences out of eclipse. He would have to work hard to ensure that he did not lose such an opportunity again. Another difficulty gradually arose as astronomical photography became an accepted part of the serious amateur's toolkit. As we saw in chapter 3, Huggins resumed his spectral research in earnest following his acquisition of the new 15-inch Grubb refractor on loan from the Royal Society in February 1871. He extended his work on stellar motion in the line of sight, and observed the spectra of planets, comets and the sun. But all of these observations, like those he had made earlier, were strictly visual. To remain a leader in astronomical spectroscopy, Huggins would need to overcome his apparent disinclination to incorporate photography in his research agenda and adapt his methods and instruments to the idiosyncracies and special needs of photographic celestial spectroscopy. It is in the context of these critical career challenges that I shall introduce Margaret Lindsay Murray, a woman nearly a quarter century younger than William Huggins, and in whom he found both a lifelong and devoted companion as well as an interested and capable collaborator. In this chapter, I present a novel interpretation of the collaborative work of William and Margaret Huggins. I argue that Margaret Huggins was more than an able assistant, amanuensis and illustrator, whose work conformed to her husband's research interests: her very presence and expertise not only strengthened but also shaped the research agenda of the Tulse Hill observatory. This new view has emerged as a result of an examination both of their notebooks and their extensive correspondence. These documents provide a vivid description of on-going daily activity in the Hugginses' laboratory and observatory, and make possible, for the first time, a more definitive assessment of Margaret Huggins' role in the work at Tulse Hill. An analysis of these documents has revealed the complexity of Margaret Huggins and the influence of her observational, interpretive, and supportive contributions. After the sale of his 8-inch Alvan Clark refractor to Charles Corbett in 1869, Huggins was without a large telescope for almost one-and-a-half years.2 Huggins had a small portable telescope with a 2-inch aperture, but there is no evidence that he used it to make any observations during this hiatus. Meanwhile, Huggins kept in touch with Howard Grubb about the instruments he was building for Huggins' Observatory: a 15-inch achromatic refracting telescope, an 18-inch Cassegrain reflecting telescope of speculum metal constructed to be mounted interchangeably with the refractor, and "specially adapted" spectroscopes of prodigious dispersive power. Huggins had other short-term projects to occupy his time while he waited for the instruments to arrive including helping Jane and Caroline Lassell, daughters of the amateur astronomer, William Lassell, to edit a translation of Heinrich Schellen's book on spectrum analysis,3 and heading a solar eclipse expedition to Algeria in December 1870.4 But these distractions did not prevent him from worrying a great deal about the personal responsibility he had assumed in accepting custody of the Royal Society's instruments. Huggins knew from his own experience that it was possible for novices like W. P. to make noteworthy contributions to this fledgling scientific enterprise. Maintaining his advantage would become less problematic once the Grubb telescope was in place. With his 8-inch telescope, Huggins had found that the feeble light of a nebula faded to invisibility when dispersed by the power of a highly refractive prism. 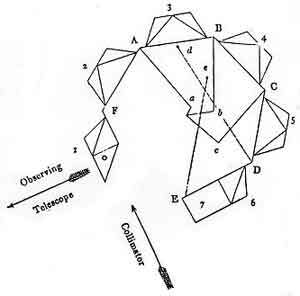 He anticipated that the 15-inch, with nearly four times the light-gathering power of his old telescope, would free him to use prisms of greater dispersive power for observing such faint objects (see Figure 25).7 Amateurs with 2- or 3-inch aperture telescopes -- even those with 8-inch instruments -- would be no match for Huggins with his new larger telescopes by Howard Grubb. Figure 25. Schematic drawing of Howard Grubb's automatic spectroscope design for William Huggins, featuring 4 compound prisms and 2 semi-compound prisms with a total disperson of about 90° [from Mon. Not. Roy. Astr. Soc. 31 (1870): 37]. But Huggins' enthusiasm for receiving these fine instruments was tempered by the recognition that assuming possession of them meant increased responsibility and challenge to stay in the forefront of research in the new astronomy. He could have used an assistant. No doubt he hoped to continue to rely on the skilled and convenient assistance which his neighbor, William Allen Miller had provided in the past whenever something new was being observed, instrumentation required an extra hand, or an observation needed confirmation.8 Unfortunately, on 30 September 1870, Miller died unexpectedly at the age of 52 after collapsing while on his way to the BAAS meeting in Liverpool.9 Thus Huggins lost the trusted hands and eyes of his principal collaborator just months before Grubb installed the new instruments.10 Because the public record provides no clues to the degree of Huggins' continued reliance on Miller's assistance after 1864, no explanation has been sought heretofore, or even thought necessary to account for the fact that when Huggins resumed his astronomical researches in February 1871, he did so virtually alone with only occasional visits from others. There is no direct information on Huggins' source of income following the sale of the family silk business, although there are occasional references in his correspondence to a reliance on rents. He did not consider himself rich. While Huggins' income cannot be known with precision, we may estimate that he took in approximately £500 per annum given the home he lived in and the fact that he employed two live-in servants.14 A paid assistant may have been a sizeable expense, and one he felt he could not afford. In time, however, Huggins would have to balance his reluctance to engage an assistant against the growing pressures inherent in assuming custody of the Royal Society's telescopes. Accounts of the work of William Huggins always mention that he was assisted in his research by his wife.26 In Mills and Brooke's Sketch of the Life of Sir William Huggins, for example, we are told that "William Huggins did not allow his marriage to interfere with his work," rather that he "derived great benefit from his wife's able assistance. "27 They cite Margaret's own enumeration of her contributions to the work of the Tulse Hill observatory which, in addition to observation, included such things as arranging instruments, working batteries, mixing chemicals, dusting and washing up the laboratory, doing "small things," and being "generally handy. "28 From the description given, the reader is led to understand that while these tasks provided essential support to the work at hand, they were nonetheless subordinate to the research agenda designed and directed by William Huggins. The Halls' household was structured around a strict division of labor. It is safe to say that Mrs. Gill can be credited with saving the expedition from total failure. Not long after the completion of the temporary observatory on Ascension, the skies began to cloud over each evening. David Gill suggested exploring the island to discover the extent of the cloud cover. Since it was necessary to be assured that the sky would be clear at night, this foray into the wild would have to be undertaken after dark. Wives of astronomers represent a special subset of that group. Their relationships to their husbands' research programs run the gamut from "telescope widow" to one half of a "two-person single career. "39 The range and complexity of the possible relationships of husband and wife research teams is such that great care must be taken in interpreting the historical record. The invisible people in scientific endeavor have in some cases been obscured by those who sought to gain the greater glory for themselves, other times they are not so much invisible as simply forgotten. But there are invisible participants who have cloaked themselves in socially appropriate ways in order to be allowed to play the game -- who not only embrace their supportive, helpmeet role, but fashion and nurture that image in the public record. To see these invisible people, we must look beyond the public record. Only there will we find the soul of the complementary collaborative couple. The historical figure of William Huggins, crafted in part by Margaret Huggins herself, has loomed large in retrospectives on the origins of what came to be known as astrophysics. 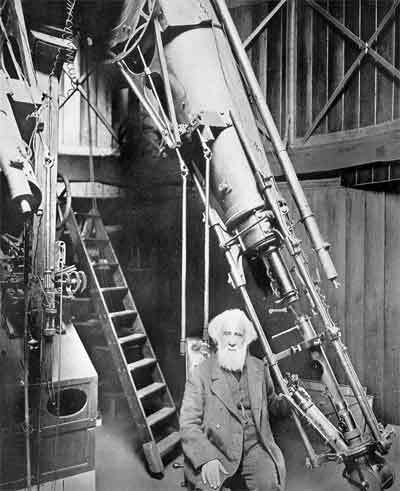 This image is reflected in the classic photograph which serves as the frontispiece for The Scientific Papers of Sir William Huggins (see Figure 26).40 Here we see the solitary stellar explorer seated alongside his star-spectroscope in his private observatory free of the distracting bureaucratic entanglements as well as the debilitating methodological and theoretical restrictions which, in Huggins' view, encumbered institution-bound observers at Greenwich, South Kensington, and Kew. Figure 26. William Huggins in his observatory (from Huggins and Huggins, Scientific Papers, frontispiece). Biographers have based their discussion of Margaret Huggins' contributions to the work of the Tulse Hill observatory on information gleaned from the Hugginses' published scientific papers and reminiscent accounts. Unfortunately, there is an alluring internal consistency in these versions of their collaborative work which has enhanced their authority over the years and blinded researchers in the past to the need to delve beyond the public façade. Reliance upon such standards for historical analysis, however, unnaturally constrains discussion of complementary collaborative efforts in the nineteenth century. Such a scheme makes little sense when describing the work of Robert Bunsen and Gustav Kirchhoff, for example, or that of George Liveing and James Dewar -- pairs of men with comparable levels of professional training and technical skill. However, when investigative partners are also husband and wife, there is a risk that a hierarchical evaluative structure may appear applicable to their joint scientific work. This risk is enhanced when the body of published papers contains what appear to be clear signatures of something like today's hierarchical teamwork structure: husband as observer, wife as instrument tender, husband as principal interpreter of data, wife as recorder, husband as analyzer of measurement error, wife as corroborator, and so on. Thus, it may seem fitting to evaluate the husband's work in terms of its originality and theoretical insight, and the wife's contributions in terms of the peripheral support it supplies the research effort. Recently, Marilyn Bailey Ogilvie has compared the collaborative dynamics of three scientific couples, including William and Margaret Huggins.42 Ogilvie has pointed out that because the Hugginses' joint published papers are written principally in William's voice, reliance on these documents alone to determine how the work, particularly that done in the midst of active observation, was divided between them, yields a limited picture of Margaret's contributions. Because of this, Ogilvie has suggested that a more accurate assessment of the scientific merit of Margaret Huggins' contributions to the work done at Tulse Hill will require an examination of relevant primary material. Ogilvie hoped that such an examination would make it possible to contrast Margaret's scientific "originality" against her abilities as data collector and supportive team member. Ogilvie is right to suggest an historical analysis of the primary sources which underlie the Hugginses' published papers. But examination of the notebooks reveals that Margaret and William did not work together as principal and secondary researchers; rather, they worked as complementary collaborative investigative partners. The constant give-and-take on which such a work relationship is based blurs the usual markers which distinguish an idea or plan's originator from its implementor. Thus, I would argue that "originality" fails, in this case, to function as a useful indicator of either William or Margaret's worth as a scientific investigator. I would propose an alternative dimension of the Hugginses' collaborative efforts, namely "individual initiative," to assess the value of Margaret's contributions. Reading the Huggins' observatory notebooks, I have uncovered evidence of Margaret's initiative in such diverse activities as problem selection, instrument design, methodological approach and data interpretation thus providing a clearer sense of the nature, extent and value of Margaret Huggins' scientific contributions to the work done at Tulse Hill. Figure 27. Margaret Lindsay Huggins (1848-1915) [from the Huggins Collection, Whitin Observatory, Wellesley College]. I have been unable to locate the school in Brighton Margaret may have attended. In fact, it may no longer exist. One girl's boarding school in Brighton which was founded in 1836 and still survives is St. Mary's Hall. During Margaret's childhood, St. Mary's Hall was a school for daughters of clergymen of the Church of England, so Margaret would have been ineligible to attend. Nevertheless, from its records we can derive some idea of the variety of subjects to which a young woman may have been exposed during the period when Margaret would have received her schooling. Margaret, like other young girls and women in mid-nineteenth century Britain, may have benefited from the spirit of educational reform which encouraged the establishment of the Public Schools Commission in 1861, chaired by Lord Clarendon and charged to investigate the growing swell of outrage against the public schools.50 While the hearings held by this commission brought to light the prevailing deficiencies of a limited school system founded on classical studies rather than the practical needs of contemporary society, they also raised the issue of the lack of educational opportunities for girls. The Commission sought to reverse the prevailing view which argued that girls were "less capable of mental cultivation, and in less need of it than boys." These changes were not enacted until 1869 with the passage of the Endowed Schools Act. Even then, it took a long time for the impact to be felt in the schools. The increased emphasis on modern languages, history and science in the curriculum at a school like St. Mary's Hall during the last quarter of the nineteenth century, for example, reflects, in part, the Clarendon Commission's recommendations for both constituting and improving educational opportunities available for girls. Figure 28. 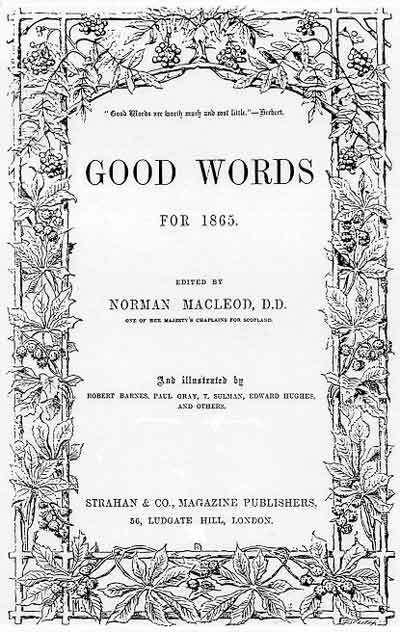 Title page from the first volume of Good Words. If this article influenced Margaret to make her own spectroscope, she may have done so to further her artistic interests. Pritchard's use of such kinetic phrases as "sudden bound," "strong impulse in a new direction," "aspires to a loftier aim," and "no longer ... restricted" conveyed the advantages he felt spectroscopy brought to astronomical research. He provided simple directions for constructing and using a spectroscope complete with suggestions to guide the reader's expectations and insure successful observations.58 If Margaret's interest in astronomical spectroscopy was indeed piqued by reading one particular article in Good Words, Pritchard's is a likely candidate. If we concede that there is some element of truth in the story that Margaret's awareness of, and interest in the work of contemporary astronomers grew out of reading something in Good Words, then it is more likely to have resulted from a combined influence of several of these articles read over an extended period of time than from any one particular article. No doubt, many gave up their scientific interests entirely or channeled their creative energies into more socially acceptable activities. The few women inclined to persevere -- if they wished to make contributions to scientific enterprise instead of simply reading about the exploits of others or attending public lectures on scientific topics -- required a tolerant male partner with whom to collaborate. Was Margaret such a woman? Or did her scientific interests emerge in consequence of an offer of marriage from a gentleman interested in finding an observing partner whom he could train to assist him in his own research program? Margaret and William Huggins were married on 8 September 1875 at the Monkstown Parish Church near Margaret's family home.65 She was about 27 years old and he was 51. 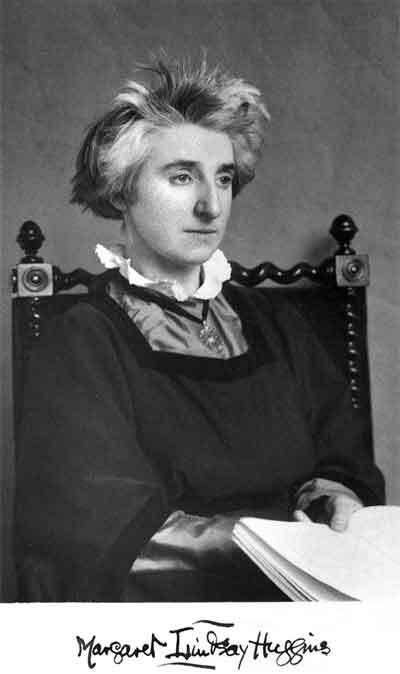 Margaret soon became involved in the work of the observatory, and her presence changed both the kind of work done at Tulse Hill and its organization. William's terse notebook jottings were replaced by Margaret's lengthy and detailed entries. More importantly, photography suddenly appeared as a new method of recording what had previously been purely visual spectroscopic observations. Evidence gleaned from the notebooks points to Margaret Huggins as a strong impetus behind the establishment of Huggins' successful program of photographic research. 1. The men most often mentioned are Sidney Kincaid and Arthur Finch, both of whom lived nearby. 2. As described in chapter 3, Corbett removed Huggins' 8-inch Alvan Clark in August 1869. The new 15-inch Grubb telescope became operational on 20 February 1871. 3. Heinrich Schellen, Spectrum Analysis and its Application to Terrestrial Substances, and the Physical Constitution of the Heavenly Bodies, Jane and Caroline Lassell, trans. ; William Huggins, ed. (Longmans, Green, & Co.: London, 1872), originally Die Spectralanalyse (Brunswick, 1871). Huggins refers to his having undertaken this task in a letter to George Airy, 28 September 1870, RGO 6.382/6/7/401, University of Cambridge Library. His notebook entries indicate that he visited Lassell at Maidenhead in March of both 1871 and 1872. See 25 and 26 March 1871, 31 March 1872, Notebook 2. 4. The eclipse expedition was clouded out, a major disappointment for Huggins who had hoped to use the occasion to examine spectroscopically the sun's outer atmosphere. I shall discuss this expedition in more detail in the next chapter. 5. W. P., "Spectroscope Construction," Astronomical Register 8 (1870): 76. 6. G. J. W., "Solar Spectrum," Astronomical Register 8 (1870): 64. 8. Miller's collaboration with Huggins was neither regular nor frequent: he was present for only about 10% of the observations Huggins' recorded in Notebook 2 before 1870. But Miller was always called upon when Huggins was observing something new, or when Huggins need support to overcome his own uncertainty concerning the interpretation of a particular observation. 9. [Coutts Trotter], "William Allen Miller," Proceedings of the Royal Society 19 (1870): xix-xxvi; xxvi. 10. In later life Huggins so successfully projected an image of himself as an independent and solitary observer during the years before his marriage that his biographers routinely wrote Miller out of the story after 1864. Dyson, for example, cited the "pressure of other duties" as responsible for Miller's discontinuing his productive collaboration with Huggins leaving Huggins to pursue "his researches single-handed" until the time of his marriage. See, [F. W. Dyson], Proceedings of the Royal Society 86A (1910): i-xix; iv. 11. William Huggins to Thomas Romney Robinson, 18 January 1869, Stokes papers, Add MS 7656.TR74, University of Cambridge Library. 12. J. A. Bennett, Church, State and Astronomy in Ireland: 200 Years of Armagh Observatory (Armagh Observatory: Armagh, 1990): 146-7. 13. A. J. Meadows, Greenwich Observatory, Volume 2: Recent History (1836-1975) (Taylor & Francis: London, 1975): 8. 14. For a discussion of the range of middle-class incomes and the accoutrements traditionally associated with those income levels, see Trevor May, An Economic and Social History of Britain 1760-1970 (Longman: New York, 1987): 201-4. Huggins' census report lists only a cook and a female house servant living in the home. 1871 Census Return for 90 Upper Tulse Hill Road, Lambeth, RG 10/684/10. It is worth noting that George Airy, the Astronomer Royal, received an annual salary of £800. 15. William Huggins recorded observations on 51 occasions in 1866, 56 in 1867, 51 in 1868, 6 in 1869, and 3 in 1870. So few were recorded in 1869 and 1870 because he was without a telescope. In 1871, Huggins noted a record 63 observations, but in 1872, this dropped to 54, with only 27 in 1873, and 15 in 1874. He recorded no observations in 1875. 16. William Huggins, 20 March 1871, Notebook 2. 17. William Huggins, Note before entry on 12 April 1871, Notebook 2. 19. William Huggins, 22 April 1871, Notebook 2. 20. William Huggins, 1 May 1871, Notebook 2. 21. Complaints about fatigue during this period appear pretty consistently in about 1 out of every 8 entries. It must be kept in mind that Huggins was nearing 50 years of age during this period. 22. William Huggins to Arthur Schuster, 3 April 1873, Schuster papers, Sc.95, Royal Society Library. Schuster, then just 21 years old, had studied spectroscopy under Henry Roscoe at Manchester and Gustav Kirchhoff at Heidelberg. See, Robert H. Kargon, "Arthur Schuster," Dictionary of Scientific Biography 12 (Scribner & Son: New York, 1970): 237-9. 23. William Huggins to W. H. M. Christie, 20 February 1874, RGO 6.174/3/8/85, University of Cambridge Library. 24. William Huggins to William Spottiswoode, 30 December 1874, MC 10.186, Royal Society Library. 26. See, for example, William Huggins, "The New Astronomy: A Personal Retrospect," The Nineteenth Century 41 (1897): 907-29, 926; Charles E. Mills and C. F. Brooke, A Sketch of the Life of Sir William Huggins (Times Printing Works: Richmond, 1936): 37-42; E. Walter Maunder, Sir William Huggins and Spectroscopic Astronomy, (T. C. and E. C. Jack: London, 1913): 64; Marilyn Bailey Ogilvie, "Marital Collaboration: An Approach to Science," in Uneasy Careers and Intimate Lives: Women in Science 1789 - 1979, Pnina G. Abir-Am and Dorinda Outram, eds., (Rutgers University Press: New Brunswick, 1987): 104-25, 111-5. 27. Mills and Brooke, Sketch of the Life, 38. 29. For a discussion of the very different relationships of two other nineteenth century astronomers' wives, Elizabeth Campbell and Mabel Todd, to their husbands' astronomical work, see Alex S. Pang, Spheres of Interest: Imperialism, Culture, and Practice in British Solar Eclipse Expeditions 1860-1914, Ph.D. dissertation (University of Pennsylvania, 1991): 147-203. 30. Angelo Hall, An Astronomer's Wife: The Biography of Angeline Hall (Nunn & Company: Baltimore, 1908): 72-3. 33. Mrs. Gill, Six Months in Ascension: An Unscientific Account of a Scientific Expedition (John Murray: London, 1880). 37. See, Pang, Spheres of Interest, 147; Steven Shapin, "The Invisible Technician," American Scientist 77 (1989): 555-63. 38. For examples of women since the Scientific Revolution who have received insufficient recognition for their astronomical work, see "The Women Astronomers," in Margaret Alic, Hypatia's Heritage: A history of Women in Science from Antiquity to the late Nineteenth Century (The Women's Press: London, 1986): 119-134; "'Women's Work' in Science, 1880-1910," Margaret W. Rossiter, Isis 71 (1980): 381-98; Londa Schiebinger, "Maria Winkelmann: The Clash between Guild Traditions and Professional Science," in Current Issues in Women's History, Arina Angerman, et al, eds. (Routledge: London, 1989): 21-38. 39. Sheryl J. North, "The Telescope Widow Syndrome," Sky and Telescope 80 (1990): 228. The concept of a two-person single career was developed to describe those occupations which the spouse of the employee is expected, or even required, to assume certain central responsibilities tied directly to the success of that employee's career. These include such occupations as the ministry, career military or diplomatic corps, high level business administration or civil service. Traditionally, it is the husband who is employed while the wife performs the necessary but unpaid duties which support the husband's career. See, for example, Hanna Papanek, "Men, Women, and Work: Reflections on the Two-Person Career," American Journal of Sociology 78 (1973): 852-72; Barbara B. Seater, "Two Person Career: The Pastor and his Wife," Free Inquiry in Creative Sociology 10 (1982): 75-9; and Gilbert W. Beeson, Jr., Influences on the Identification of Wives with the Air Force Organization: An Examination of the Two-Person Career, dissertation (University of North Carolina, 1986). 40. Frontispiece, William Huggins and Margaret Lindsay Huggins, The Scientific Papers of Sir William Huggins (William Wesley and Son: London, 1909). 41. See, for example, Derek de Solla Price, Little Science, Big Science (Columbia University Press: New York, 1963): 86-91; Warren O. Hagstrom, The Scientific Community (University of Southern Illinois Press: Carbondale, 1965): 105-58; Alvin M. Weinberg, Reflections on Big Science (MIT Press: Cambridge, 1967): 47-53; idem., "Scientific Teams and Scientific Laboratories," Daedalus 99 (1970): 1056-75; Lowell L. Hargens, Nicholas C. Mullins and Pamela K. Hecht, "Research Areas and Stratification Processes in Science," Social Studies of Science 10 (1980): 55-74. 42. Ogilvie, "Marital Collaboration," in Uneasy Careers and Intimate Lives: 104-25. 43. There have been a few recent brief biographical accounts of Margaret Huggins. M. F. Rayner-Canham and G. W. Rayner-Canham include a few paragraphs on her in their paper, "Pioneer Women in Nuclear Science," American Journal of Physics 58 (1990): 1036-43. Unfortunately, there are a number of factual errors in this essay. I have already cited Marilyn Ogilvie's treatment of Margaret Huggins as her husband's collaborative assistant in Uneasy Careers. Perhaps the most detailed examination of Margaret Huggins' early life has been carried out by two British astronomers: Dr. Maire Brück, formerly at the Dunsink Observatory and the University of Edinburgh, and Dr. Ian Elliott, currently at the Dunsink Observatory. Much of the information in this section was made available to me through the kindness of Drs. Brück and Elliott before their published accounts appeared. See, Mary T. Brück, "Companions in Astronomy: Margaret Lindsay Huggins and Agnes Mary Clerke," Irish Astronomical Journal 20 (1991): 70-7; Maire T. Brück and Ian Elliott, "The Family Background of Lady Huggins (Margaret Lindsay Huggins)," Irish Astronomical Journal 20 (1992): 210-1. 44. 9 September 1875, Irish Times. I would like to thank Dr. Ian Elliott of the Dunsink Observatory, Dublin, for making this information available to me. 45. Dr. Ian Elliott to the author, 3 October 1991. According to Dr. Elliott, this information was taken from Thom's Directory. 46. Dr. Maire Brück to the author, 17 October 1991. 47. Margaret's mother, Helen Lindsay, died in January 1857 at the age of 31. Margaret would have been eight or nine years old. 48. Joan N. Burstyn, Victorian Education and the Ideal of Womanhood (Rutgers University Press: New Brunswick, 1984): 30-47. 49. Personal communication, 5 July 1991, Mrs. M. Teresa Broadbent, Headmistress, St. Mary's Hall, Brighton, England. 50. S. J. Curtis, History of Education in Great Britain (University Tutorial Press, Ltd.: London, 1948): 76-91. 51. Schools Inquiry Commission, Vol. I, p. 546; cited in Curtis, History of Education in Britain, 89. 52. Sarah Frances Whiting, "Lady Huggins," Science 51 (1915): 853-5; 854. See also, Whiting, "Margaret Lindsay Huggins," Astrophysical Journal 42 (1915): 1-3; Louise Manning Hodgkins, "Lady Huggins: Astronomer," The Christian Advocate (21 October 1915): 1417-8; H. F. Newall, "Dame Margaret Lindsay Huggins," Monthly Notices of the Royal Astronomical Society 76 (1916): 278-82; Ogilvie, "Marital Collaboration," 110. 53. Anonymous, "God's Glory in the Heavens," Good Words 1 (1860): 23; 116; 161; 225; 289; 465; 513; 577; 625; 729. This series included such articles as, "The Moon, is it Inhabited," "The Approaching Total Eclipse of the Sun," "Comets --Their History," and "The Structure of the Planets." Good Words had a readership of 70,000 and cost only 6 pence per number. Maire Brück to the author, 17 October 1991. 54. John Herschel, "On Light," Good Words 6 (1865): 358-64; 363. 56. Charles Pritchard, "A True Story of the Atmosphere of a World on Fire," Good Words 8 (1867): 249-56. 59. Charles Pritchard, "Perceiving without Seeing," Good Words 10 (1869): 45-53; idem., "Historical Sketch of Solar Eclipses," Good Words 12 (1871): 628-37; Richard A. Proctor, "A Giant Sun," Good Words 13 (1872): 98-104; W. B. Carpenter, "Spectrum Analysis," Good Words 14 (1873): 356-64 and 528-31. 60. Charles Pritchard, "Stars and Lights; or, the Structure of the Sidereal Heavens -- V. The Arrival of Herschel's Faithful Assistant," Good Words 10 (1869): 609-14; 613-4. 61. Hodgkins, "Lady Huggins," The Christian Advocate (1915): 1417-8; 1417. 62. Mills and Brooke, Sketch of the Life, 33-4. 63. A collection of historical case studies concentrating specifically on the opportunities and impediments faced by women who made their principal scientific contributions in the context of collaborative scientific couples can be found in Creative Couples in Science, Pnina Abir-Am, Helena Pycior and Nancy Slack, eds., (Rutgers University Press: New Brunswick, forthcoming 1993). 64. John Ruskin, "Of Queens' Gardens," Sesames and Lilies (George Allen: London, 1905): 117-8. 65. Marriage Record, 8 September 1875, Monkstown Parish Church, Dublin County. I wish to thank Dr. Ian Elliott for making this document available to me. Unlocking the "Unknown Mystery of the True Nature of the Heavenly Bodies"
Achieving "A mark of approval and confidence"
Margaret Huggins: The myth of the "Able Assistant"